No-one seems to know for certain when Newton-le-Willows Gardeners' Association was inaugurated and the oldest minute book we have is dated 1923, possibly it all started during the First World War as a "Dig for Victory" campaign which is quite a reasonable assumption as that was when the original Rob Lane allotment site was created. 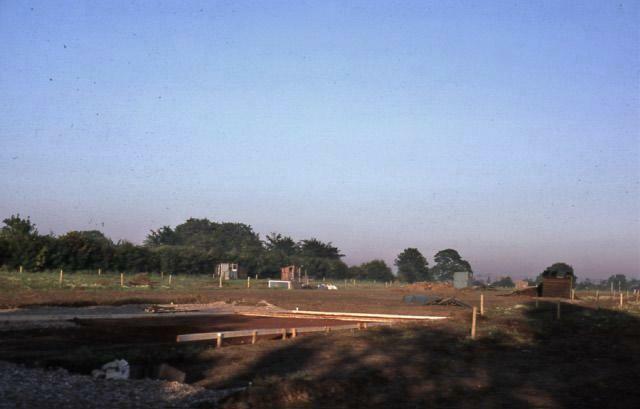 The original site for the allotment, formerly a football field, was situated behind the houses in Rob Lane (where the Parchments Estate is now) towards the Pied Bull Hotel, in fact it used to be known as the "Pied Bull Allotments" and the football pitch was known as the "Pied Bull Field." Some of our older members had allotments on this site and they recall finding coins dating from the early part of the last century and also many fragments of the old clay tobacco pipes, presumably dropped by football spectators. Reference in John Lane's History of Newton to the establishment in 1886 of a Newton-le-Willows, Earlestown & District Horticultural Society, which used to hold its "Yearly Exhibition" in the grounds of the former nursery which became John Randall & Son. So it is quite possible that the Association albeit under different names has been around for well over a hundred years. 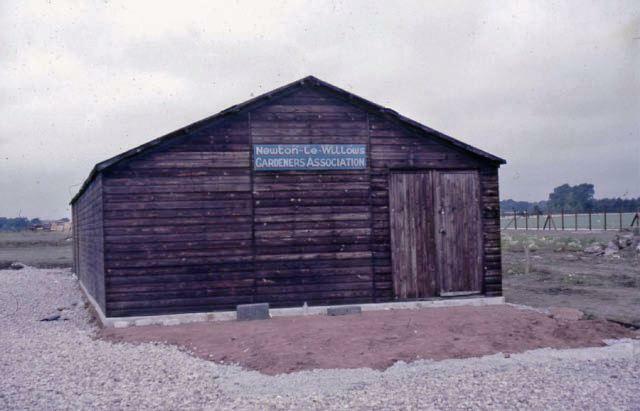 The Association was for many years known as the “Newton-le-Willows Gardeners’ and Allotment Holders’ Association” but this was shortened in the 1940s to the present title. 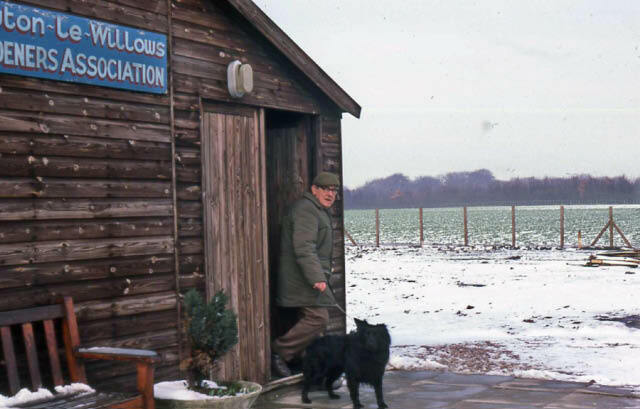 Although the allotments were always administered by the local Council - Newton Urban District then later on St. Helens Borough - the Association did in many ways help with allotment affairs in Newton, having representatives on the Council Allotments Committee and liaising with the Council about improvements and alterations to the sites, and vetting new tenants. 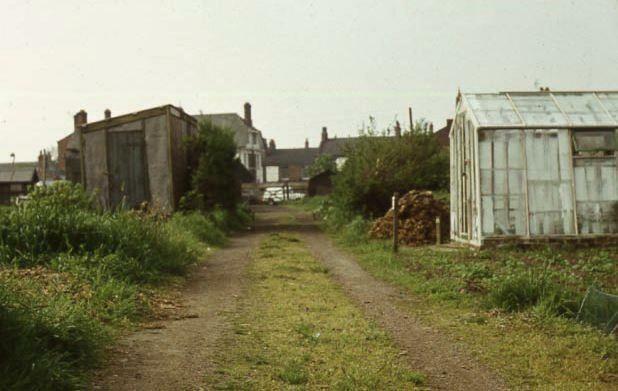 A view of the old Rob Lane allotments taken about 1972 looking towards the gate. The Pied Bull Hotel can just be seen in the background. The "Hut" was just inside the gate and pictured here is the first caravan with one of the sheds. The other caravan and shed were to the rear. 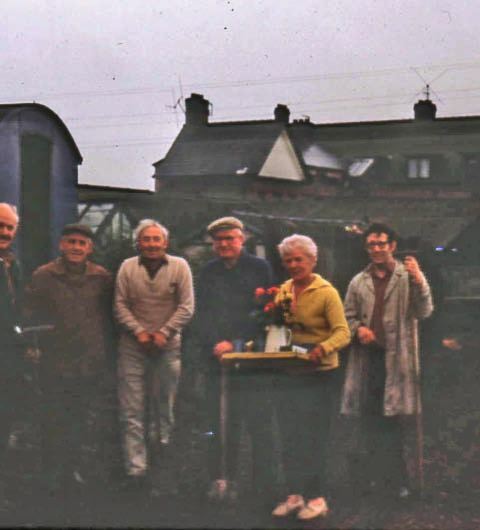 The Association was very much to the fore in the fight to save the old Rob Lane Allotments during the 1980s, and after this fight was lost then came the big move to the present site. Although we fought tooth and nail to save the old site from the building developers, forcing the issue to a Public Inquiry, the new site was soon found to be much larger and better than the old one. It was St. Helens Council’s wish that the new site should be “self-managed” and the Gardeners’ Association was asked to undertake this task, but for various reasons some allotment holders were against this and voted to form their own society and thus the “Rob Lane Allotments Association” was born, although for many years most of the committee members were also members of the “Gardeners” committee! It was always intended that the two Associations should be merged at some time in the future, and the allotment holders actually voted for a merger at their AGM in 2002. St. Helens Council took nearly two years to ratify this decision. Although finally ratified in 2004 and the required constitutional changes required to make this happen agreed by the AGM. The dialogue between the two bodies gradually ground to a halt and the idea has failed to come to fruition. 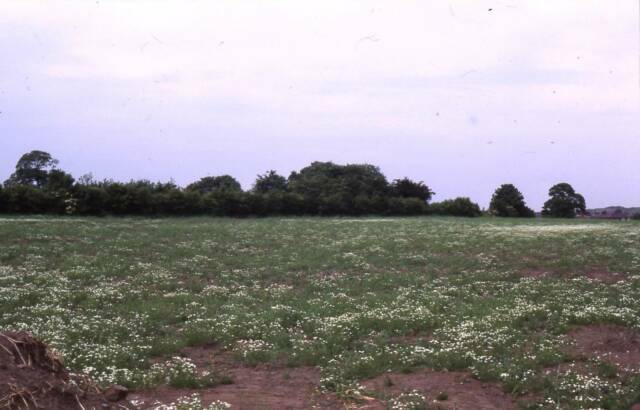 Picture taken in summer 1986 of the field which became the new allotment site. The Parchments Estate was built behind the hedge which was then replaced by a fence. 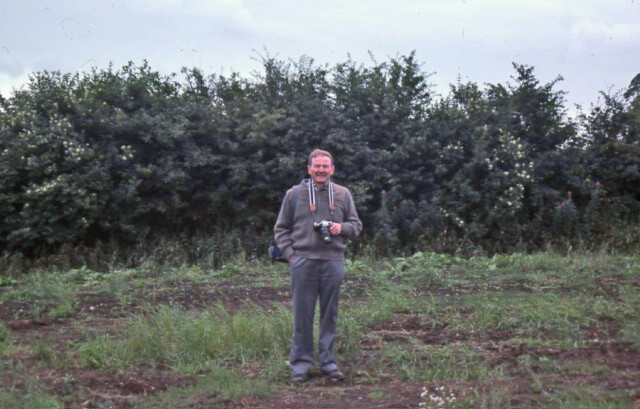 Brian Brady, a former Chairman of the Association in the early 1970s surveys the site of his new plot (No. 10). The Hut being dismantled ready for removal to the new site. 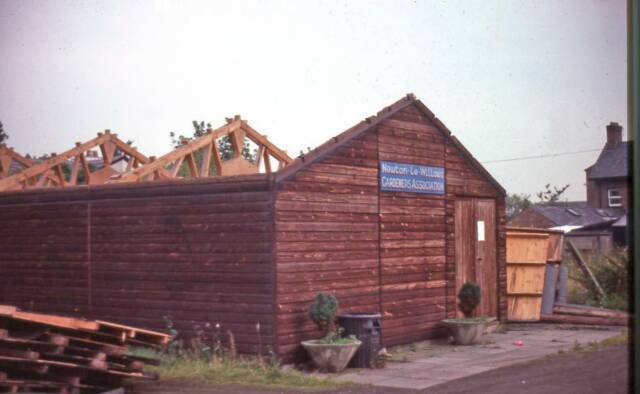 This is our present Hut when it was on the old site. Picture taken January 1979. Houses in Rob Lane are in the background. The second (yellow) caravan and second shed (an old hen house donated by Miss Joan Hayes of Redclyffe, Mere Road). The working party are laying flagstones. From left to right - Harry Bottomley, Eddie Poole, and John Townsend (standing up). Picture taken in April 1987 - looks like it was a cold one that year! Ernie Watson is seen leaving with his dog. Our older members will remember Ernie giving his impromptu gardening lectures whilst working the till, completely oblivious to the ever-growing queue waiting impatiently to be served! 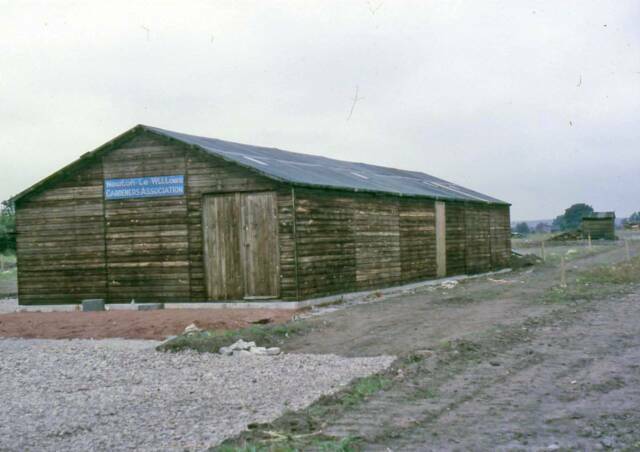 The earliest known ”Sales Hut" was on the old Birley Street allotment site, and this was moved to Rob lane in 1964 when the Birley Street site had to make way for the new St. Peter's School playing fields. 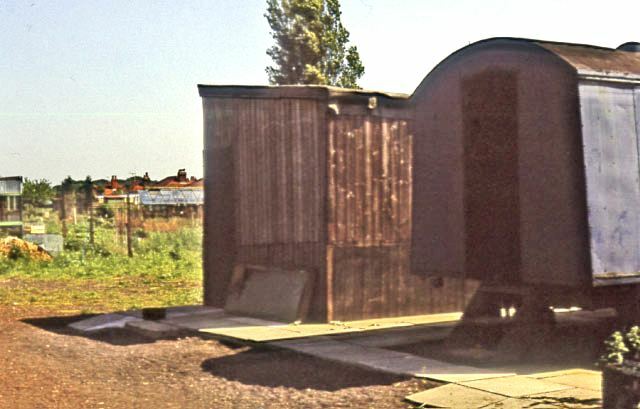 The Hut at Birley Street was just a fairly small shed, and the first Hut on the old Rob Lane site was an old caravan which had previously belonged to the Highways Department. 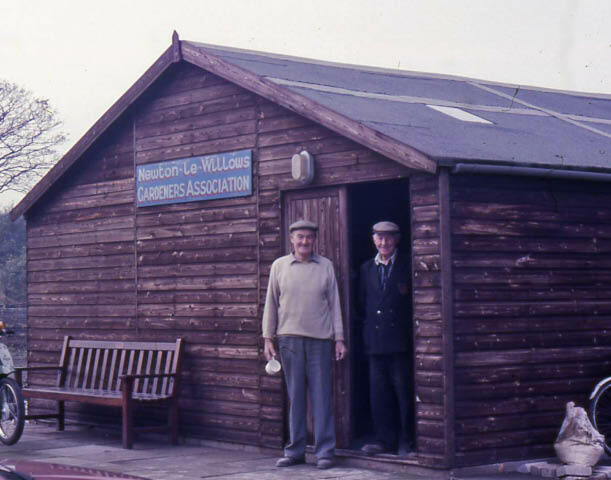 As the Association prospered at Rob Lane another caravan was acquired together with two sheds, and with the help of the former Newton-le-Willows Urban District Council, this untidy collection of buildings was completely replaced in 1974 by the present building. 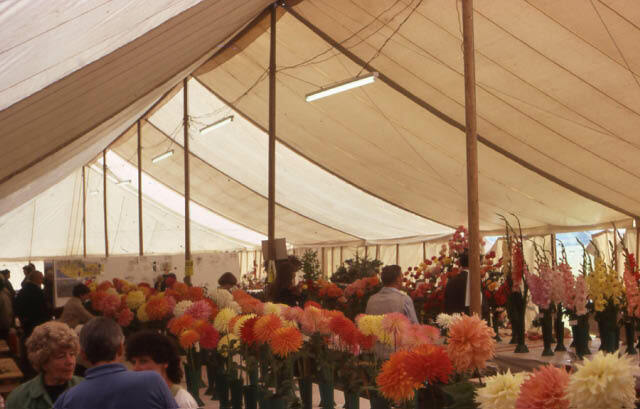 The winter of 2005 saw a drastic change in the internal lay-out of the sales hut during the closed season, making it easier to use and give it an airier, brighter, friendlier atmosphere. During these changes it became obvious that the strength and fabric of the building need to be improved to ensure its long term viability. A proposal to demolish and replace the building was given some very serious thought and estimates for a replacement building were obtained. Initial enquiries with the Council and the Water Company then revealed a fatal flaw in the plan to replace the building – the Water Company stated that in the event of any new building in the present location being proposed, they would object strongly on the grounds that the building would be too close to two large diameter water mains that run under the allotment site - in other words we would not be allowed even to replace the present structure with one of equal size. Under the circumstances, the committee decided to strengthen and then refurbish the building. The first part of strengthening the building, the steel reinforcing bars and ancillary metalwork was completed during the summer of 2008 along with strengthening of the roof structure. The work to complete the re-facing of the hut was completed in early 2009, covering the whole building in a steel shell which we hope will help the building last for many years to come. As a result, the building now looks a little less stressed and is much more weather-proof. The last remaining job was the completion of the re-guttering, most of which has been undertaken by four of the committee members at the end of 2010 before the really bad weather set in for the winter. 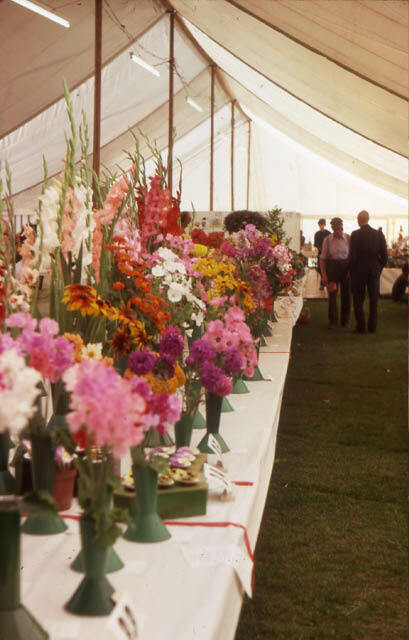 From 1976 to 1991 the Gardeners' Association organised the Flower Show at Newton Town Show in addition to its own Shows. These pictures were taken in 1982 when the Show was staged in a large marquee on the Newton Grammar School playing fields. 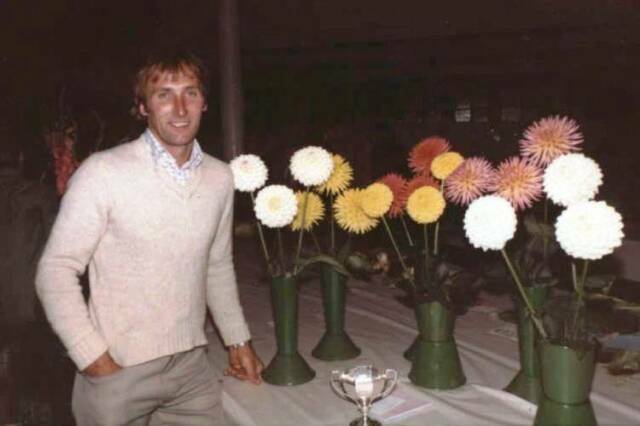 The Show was extremely successful in the 80s attracting exhibitors from all over the North West. When the Grammar School site was taken for building, the venue was changed to the Cricket Club for a couple of years, and finally to St. Aelreds' College playing fields, but the Show was never as successful at these locations. This is a picture taken at one of our shows at Newton Civic Hall probably late 1950s. The gentleman on the right is Mr. H.K. 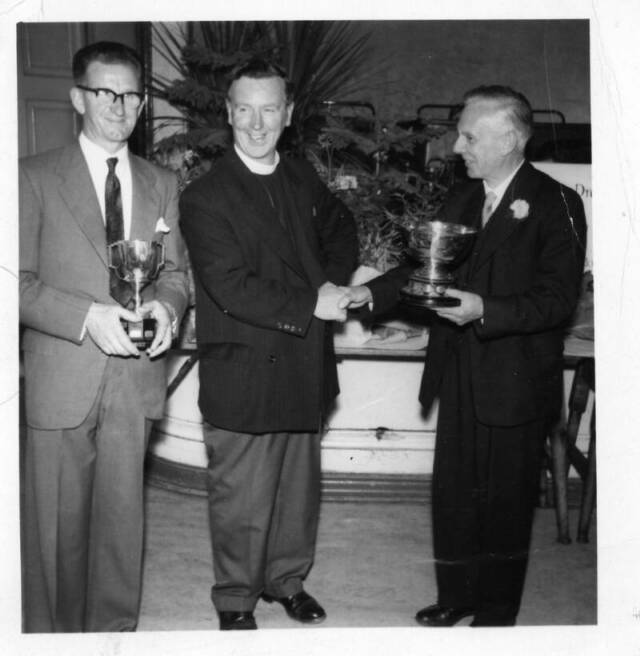 Jeacock, our Chairman at the time, seen presenting a trophy to the Rev.J.J. Broadhurst, vicar of St. Peter's Church who was a keen exhibitor at our shows, his speciality being gladioli. We have been unable to identify the gentleman on the left, so if one of our older members could help us this would be very much appreciated. Photograph donated by Mr. Tom Tyrrell who was a reporter for the Newton News at that time. 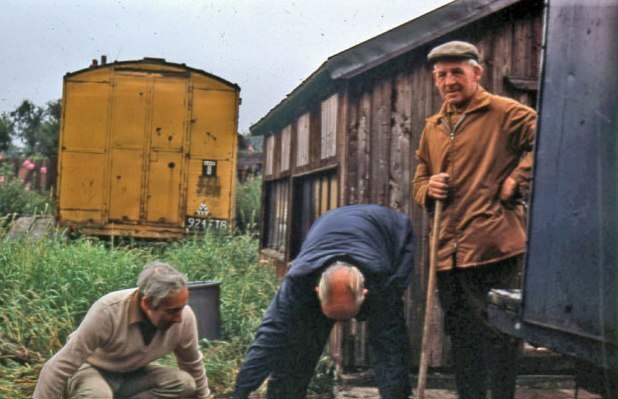 A working party outside the Hut in October 1972. From left to right Eddie Poole (Half off the picture and one of our best ever Show exhibitors), John Townsend, Harry Bottomley (a former Chairman), Harry Brownbill, Mrs. Jeacock (the then President of the Association - providing the refreshments), and Timothy Bower. The top of the Pied Bull is seen behind. Apologies for the poor quality of the image. 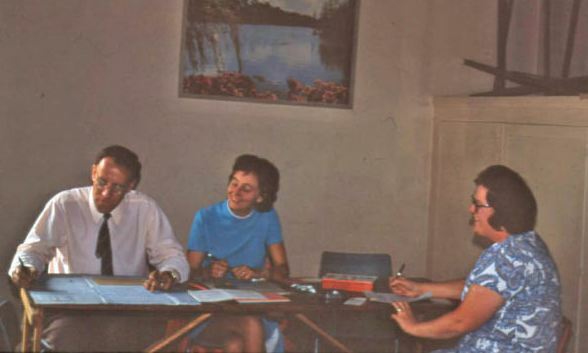 Picture taken in 1974 of Eddie Scholes, our Show Secretary that year working on the score sheet assisted by his wife Barbara, with Joy Burman, Assistant General Secretary looking on. If more old pictures are found they may be added to the collection from time to time. 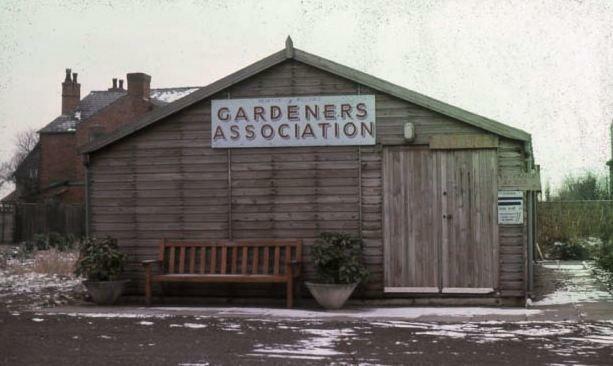 If anybody has pictures of the shows or the allotments or any information about the Gardeners' Association that they would like to share then please let us know. Our Chairman Tony Addison and Malcolm Greenhalgh have had opportunity of examining Committee Minutes and other documents that go back to the early 1920s. We thought that present members might be interested in these bygone days, so we begin with the dark days of 1939-45. On 2nd October 1939 the Committee were concerned that many allotments in the town were vacant, so they asked the Council to waive rent on these for six months so that they could be brought into cultivation. Lime, fertilisers and good old muck were essential to produce good crops. In September 1941, each member was allowed only one 14lbs bag of Basic Slag at a price of 9d; but 2 tons of Hydrated Lime had also been purchased. By 1942 the Association was selling 5 tons of lime to members that had been bought through MAFF’s Land Fertility Scheme. Manure was bought from Earlestown Co-op Ltd at 11/6 per ton. Where did the Co-op get it? From its cart horses, of course! Something called M-O-M was popular; some sort of bagged manure? It sold at 4/6 per 56lbs bag. But what was M-O-M? Lots of potatoes: In 1941 the Association sold 2½ tons of seed potatoes to members, and in 1942 4 tons of 12 varieties. Most varieties are not heard of today, but some are (e.g. Arran Pilot, Sharpe’s Express, King Edwards). In 1944 there was a big “debt caused by the over ordering of Potatoes,” so members were asked what they wanted for the 1945 season before ordering. The order fell to 18cwts (a ton has 20 cwts!). Of course, spuds are a staple, and to encourage their growth, in 1939, a “Potato Competition” took place. Each entrant was charged “6d as an entrance fee, that included the potato sets...Each entrant would recieve [sic] one pound of sets,” and the participant was not allowed to cut these sets into more than twelve. The potatoes were dug and weighed, with Committee present, on October 7th, which meant a long day of traipsing around allotments and gardens in the town. First prize was 5/- , second 2/6. Lots of peas and beans were grown: In 1940 14lbs of each of four pea varieties were purchased (Rentpayer, Progress, Kelvedon Wonder, The Lincoln), together with lots Dwarf French Beans (Canadian Wonder and Masterpiece), Runner Beans (Scarlet Runner) and Broad Beans (Long Pod). In 1943 56lbs of shallots were purchased at 9d per pound, and sold to members at 1/-, and seeds from two varieties of onions (Ailsa Craig and Bedfordshire Champion) were sold by the half ounce. Beetroot, carrot and swede completes the seeds sold by the Association. No where are brassicas (cabbages, sprouts etc) mentioned! Didn’t they like their greens? Each year from 1942 the MAAF distributed free vegetable seeds collections from the USA (no nylons, though) in Newton through our Association. They went to schools (Earlstown Manor, Wargrave CofE, and Newton Council Junior and Senior), local hospitals and OAPs (note that some Lancashire schools and hospitals still had veg plots well into the 1960s). In 1940 12 unemployed members in the town each received a free collection of veg seeds. Peas need pea sticks: In March 1940 the Secretary wrote “to the Foreman of Haydock Park asking if it would be possible to let us have 50 Bundles of Pea sticks...” They cost £2.10.0. “Pea sticks over from last year be 3d per bundle,” records the Minutes. THE SALES HUT gets a first mention in 1943, when a new on was purchased. A rota for sales began in 1941, the hut being open 1.30-4.30pm Satrurday, 10-12 noon, Sunday and every evening from 6-8. In May 1945 there were plans to have a shop window on one side of the hut, “so that we can display any goods we have for sale.” Can you imagine having such a window in our present hut! 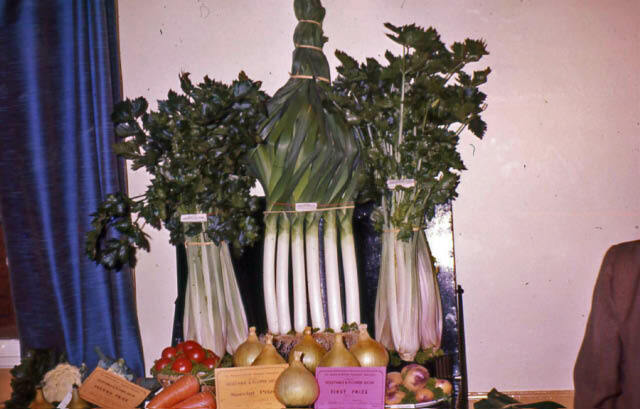 On 1939 the annual Show was cancelled, but it returned in 1940 as “strictly a Vegetable Show.” In 1941 a hamper of vegetables was rafled at 3d per ticket and £8 went to the Red Cross. And in 1942 a full Show took place, which ended with the “Sale of Vegetables at 6.30pm followed by a Whist Drive and Dance...till 11.45pm”. 1942 also saw our first Rose Show, again raising money for the Red Cross. That May saw the first money raised (£4.14.0) for the Memorial Cottage Hospital. In August 1943 the annual Show was in aid of the Red Cross Agricultural Fund, raising £30.10.0. Hot Pot Suppers were also held, in the Pied Bull, the first on 12 November 1943. Did they not know that there was a war on? !